It was a washing machine. Simply "Swap the soapy water for dialysis fluid, hang a couple of twin-coiled kidneys inside, connect the patient to the kidneys and allow the movement of the water in the washing machine to rinse the blood." Kolff's Japanese assistant, Yukihiko Nose, had suggested the idea after having performed similar experiments with washing machines in Japan. After testing a number of washing machines, the pair concluded that the popular Maytag washer best fit their need. 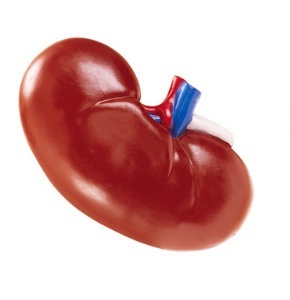 Kolff proudly announced that patients with kidney disease could save their own lives at home for just $265 per month. Twenty-eight patients were sent home with a Maytag artificial kidney before a Maytag lawyer came knocking at the door of the Cleveland Clinic. Kolff said in an interview: "The moment I saw him, I knew I was in trouble." The lawyer made it plain that if a patient were to die using the Maytag as an artificial kidney, court-awarded damages would be considerable. Moreover, dealers were instructed not to deliver anymore machines to Kolff. Kolff was undeterred. In 1967, he heard about a stockpile of rocket nose-cones that the U.S. government had abandoned. By turning them upside down, they were the perfect size for a rinsing fluid tank. Kolff found about 30 of the nose cones and turned them into nose-cone dialyzers, delighted that he could transform something designed for destruction into an apparatus to save lives. The nose-borne kidneys worked perfectly but did not prove to be commercially viable.